I’ve not been finishing any of the Amarna pieces for presentation, because once mounted and framed, they take up much more space, and also because I’m not sure which pieces are going where. However, the needlefelted pieces are not going to form part of the main panels, and I rather think it may take more than one attempt to get them just right. I’ve decided I want to present them rather as pieces of fresco are presented in museums, on a background which is similar in colour to the main colour, but not close enough to mislead. So the first thing to do was to find a suitably-sized artist’s canvas, and cover it with some padding and then a nice woollen fabric which is a warm yellow, slightly darker than the felt background. Then I cut around the Amarna Geese to make a rough, uneven shape. I should probably have cut off a head or something so that the fresco would look suitably fragmentary, but I simply couldn’t bring myself to do that! 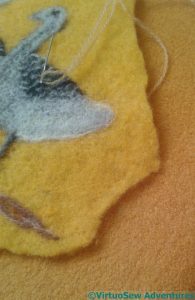 I used a fine woollen thread to attach the felt to the background fabric, as far as possible remaining within the thickness of the felt. That was quite tricky, and I wonder whether there might be an easier way. I’m glad I didn’t start with the two princesses! My Morse Code signature is in double straight stitches, following an edge. And there’s a bit of a corner left open there. 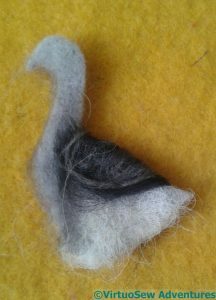 I might do an extra goose head and add it in as a separate fragment! I’ve started adding more detail with needle and thread. The chevron pattern, the eyes, and the detail on the beak are all made using straight stitches in single strands of Appletons wool. I can’t think where I got a whole series of greys, unless it’s from hand-me-downs. I’m glad I have them now, but it isn’t a colour I much like and I can’t imagine going out and buying them! For the legs, I have used three different colours of wool in the needle. 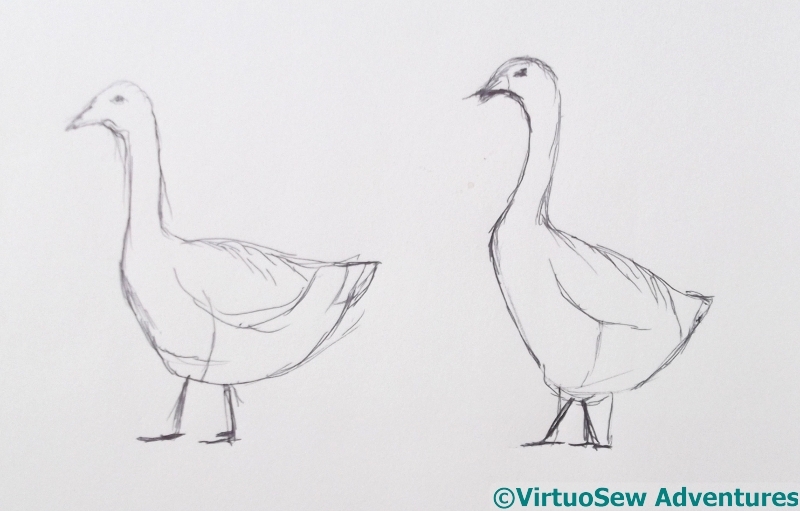 I can see that for all my staring at photographs and trying to sketch, I’ve not really got a clear or accurate idea of the details of goose anatomy! 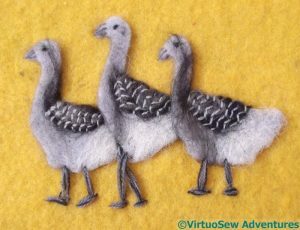 And somehow, for all my care in placing the cut out felt geese, they’ve ended up attached in not-quite-the-right place. I’ve also added some ground below the the geese. Three strands of different colours of wool, again. I did a sort of loopy knot stitch crossed with a split stitch, which I couldn’t reproduce if I tried. But it produces a very good broken-ground effect, so as long as I don’t decide I need more ground, we’ll be fine. Then I sat down at the embellisher and tried to blend the fabrics together. This meant quite heavy embellishing, but fortunately the fabrics are none of them dense, so there was room for the fibres to mingle. When I noticed that the legs weren’t getting caught in, I twisted some more threads around them. That’s better. Then another pause. Do I add leaves, to match my vague memory, or shall I leave well alone? 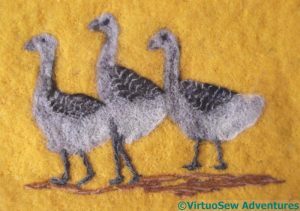 I have a picture in my mind of a gaggle of geese, fresco’d on an Amarna wall. Unfortunately, all my rummagings haven’t turned up a reference or any idea where I saw it. So I am going to make it up! 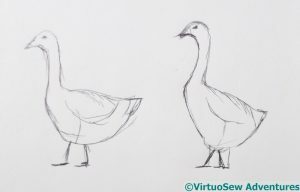 I spent some time online, looking for pictures of geese, and made some sketches. I’ve decided to use my embellisher – this is a sort of “bonus” project, as it won’t go on the main panels. 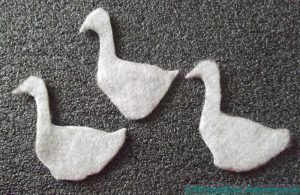 So the next stage was to cut out some geese from some light grey pre-felt. 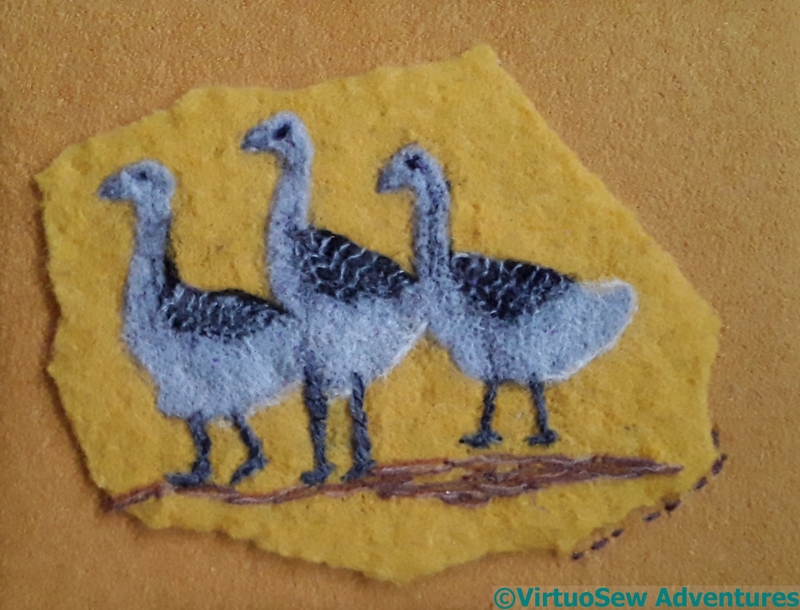 One of them is to be slightly more upright than the other two, but since needlefelting – like wet felting – reduces the dimensions of the piece, it’s anyone’s guess how clear that will be when I’ve finished! I’ve tried to create the basic appearance of the goose using fragments of wool – several shades of grey merino, and some of the very wiry white wool from Heligan. It’s all needlefelted into place by hand. Not enough hands – I’m sure I could have done with another pair, or some other way to control the bits I hadn’t managed to deal with yet! 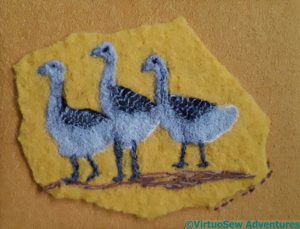 At this point there was a pause for thought… I have neither the inclination nor the patience to add the details with needlefelting, but equally, how much detail will I really need?